Title: HLCX 6425 and CSX 7879 Wait in the siding For Another train to pass. Description: CSX Q157 has just been recrewed in Buffalo and begins it's journey west to chase the setting sun. Description: A K-train ambles thru Emerson on it's way South. 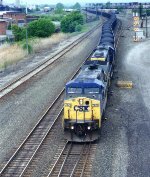 Title: CSX 7879 on the lead of a train out of Brills yard heading south along Doremus Ave. Description: After working Manville yard, CSX Q300 departs at 10:15 on this Sunday morning. Description: CSXT 7879 passes under the signal bridge at CP 3859 now known as Burnette. Description: Trio of quite clean looking YN2 GE's hustles CSX general freight Q410 eastbound over the high line at CP Field. Description: I used to be able to get several intermodal trains at this spot in daylight, but today, MOW has made this Kodak moment possible. Q177 has been running up to four hours early to be in Taft by 6PM. Description: 10 years ago, this was an every day scene. When the intermodal schedules were changed, Q177 barely gets to Sanford in daylight, even on the longest days of the year. Today, MOW needs the tracks cleared by 6PM, so Q177 is daylighted on its whole run. Title: Gliding downhill towards Hyndman.